Hi there - recently joined. Have not long ago posted a query re "Petard" elsewhere on this site, regarding finding photos of her. I usezd to do delivery work for Babcocks Disposals and took "Petard" to Portland from Pembroke Dock in May 2002. At one time there was talk of me taking her to Maryport - perhaps that was for you as new owner? Had a pretty hairy delivery voyage and would be the first to admit after a career in MN in larger vessels I was scared sh*tless by her performance in mod/heavy following seas! Hiya there seems to be some confusion over the new roles of Wellington and Hurricane. On a number of websites they are listed as going to Ghana. This is incorrect. Myself and 3 guys delivered the vessels from Rosyth Dockyard to Guinea Bissau and not Ghana. Note I am the person on the left in the NEW LIFE photo along with Tony Byrne and the flag flying on the mast is the Guinea Bissau national flag. Our understanding wss that the vessels would be used for Fishery protection type duties. The photo, although I do not specifically remember it being taken, must have been taken on the final transit into Guinea Bissau and probably by John on the Hurricane. Note the extended range fuel tank on the back, we had to each take an additional 3 tons to syphon into the tanks on the route from Tenerife to Cape Verde. Hopefully this clarifies some incorrect information. Happy to answer any questions etc any of you may have. We were returning to Invergordon, after dampening some aircrew at Burghead, as we came through the Cromarty Firth one of the crew noticed a small boat, about 18ft, the occupant frantically waving. He was adrift having lost his engine, we offered a tow, he accepted; we had travelled about 100yds, the occupant of the boat was leaping up and down again. At one engine slow ahead we had pulled the propshaft couplings and reduction gear off the back of his gearbox. HMAFV Spitfire, on delivery to RAF Mountbatten. 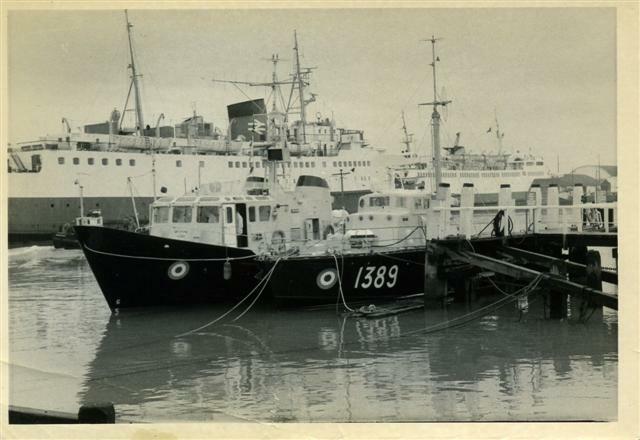 Photographed at Newhaven by me, I was, at the time, the Marine tech on Pinnace 1389. Note the length of Spitfires bow compared to previous pictures on this thread. She had to go back to Brightlingsea to have a few feet added. The full-sized photo shows her nameplate still as WELLINGTON. Lax uniform requirements in Ghana apparently! What is she (and Hurricane) called now?